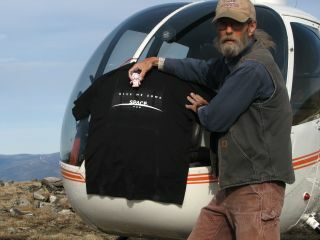 Helicopter pilot Mike Terwilliger recovered a SPACE.com T-shirt that launched toward Alaska's northern lights displays aboard a weather balloon in mid-April 2012. Terwilliger found the balloon payload containing the T-shirt on May 25. The only SPACE.com T-shirt ever to have a close encounter with the northern lights has been rescued from the rugged backcountry of Alaska. A helicopter pilot hovered over a mountainside to retrieve a weather balloon launched to get up-close views of the Great White North's dazzling northern lights displays. The shirt went aloft with the balloon's instruments, and everything fell back to Earth when the balloon ruptured about 19 miles (30 kilometers) up or so. "The recovery of the payload with your T-shirt was rather interesting, to say the least," pilot Mike Terwilliger told SPACE.com via email. Expedition members were not able to retrieve six of the fallen balloons before leaving Alaska in mid-April. But with a little help from some locals, the six have all been recovered now, project leader Ben Longmier said. The balloon with the T-shirt was grabbed May 25 by Terwilliger, a helicopter pilot with a Fairbanks-based company called Quicksilver Air. But it wasn't easy. "The payload was about 30 miles NW of Fairbanks, on a very remote tree-covered mountainside," Terwilliger reported. "The only landing site was about 2 miles away. To retrieve the payload, I used an 80ft long line with a grappling hook on the end to hook the balloon, carry it to the landing site, then gather it up." Longmier, a plasma physicist at the University of Houston and the chief research scientist at Ad Astra Rocket Co., appreciated the effort. "This is a really tricky maneuver and requires a lot of piloting skill," he told SPACE.com via email. "We were lucky to have such a dedicated flight recovery team at Quicksilver Air in Fairbanks!" Longmier and his team want the recovered balloons' scientific gear back, including their GPS devices and the memory cards from their high-definition GoPro cameras. But Terwilliger will keep the SPACE.com T-shirt and a few other items from the several payloads he recovered, including a camouflage-clad toy bear. The T-shirt is "going to a place of honor in our home, along with 'Camo Bear' … which Dr. Longmier is getting signed by the team that made the launches," Terwilliger said. The expedition launched the cameras and other instruments in an effort to gain a unique perspective on the northern lights. Project Aether: Aurora hopes to inspire schoolkids all over the world to get more interested in science, technology and math, and ultimately to consider a career in these fields. The team aimed to capture stunning aurora footage that will help catch students' eyes, and it's been working with GoPro to get the expedition's images out to the public. Follow SPACE.com senior writer Mike Wall on Twitter@michaeldwall or SPACE.com @Spacedotcom. We're also on Facebook and Google+.